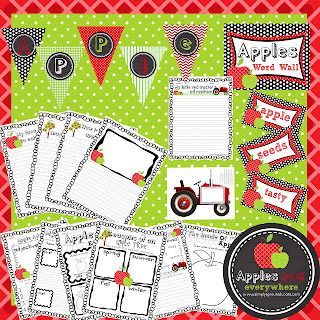 What says the beginning of the school year and fall more than APPLES! We eat them, we love them, but do we know the science behind them? We did a little experimenting in science this week to find out more about these delicious little fruits. 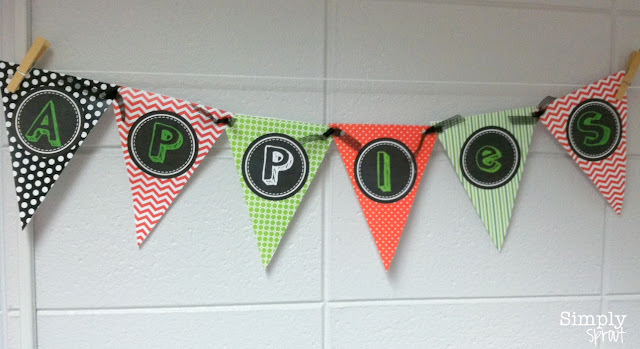 Look how adorable this pennant banner turned out in my classroom from our Apples, Apples Everywhere kit in our Simply Sprout store. My favorite part about it is that the letters come in white and green. My little helper bee of a student put it together with one white letter and I couldn't bear to change it! She is a special apple in the bunch! Since my students are learning all about the scientific method before starting their science fair projects, we did a quick experiment. This is a super simple one to do at home too! Before starting your experiment make sure to have children make observations, predictions, pose questions, and create a hypothesis. Directions: Peel and slice the apple, and cover one slice of apple with water in one bowl. In a second bowl, squeeze half of a lemon on another apple slice. 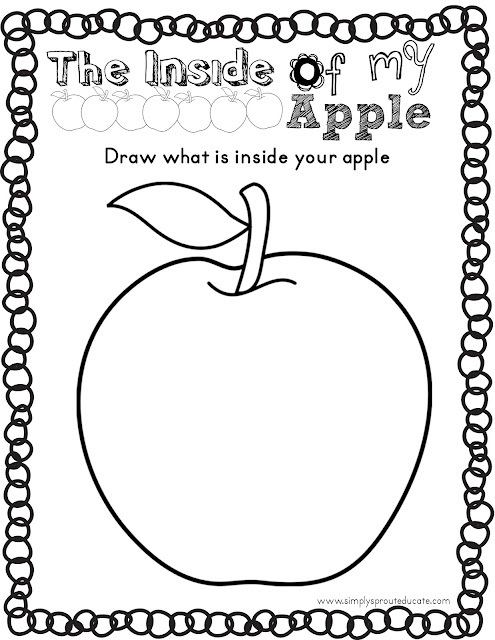 In the third bowl, leave a slice of apple exposed to air. Let the apple slices sit for one hour. During that hour we made several observations and journaled about what we saw. Remind students that it's important to jot down the time of each of those observations. While we waited for our apples to do their thing, we dissected apples as well. This was a great activity to teach the importance of diagramming and labeling. We worked with our younger science buddies on this project, so it was important to choose an object that was appropriate for both age groups to dissect and diagram. The cute diagram sheets came straight out of Simply Sprout's Apple kit as well. 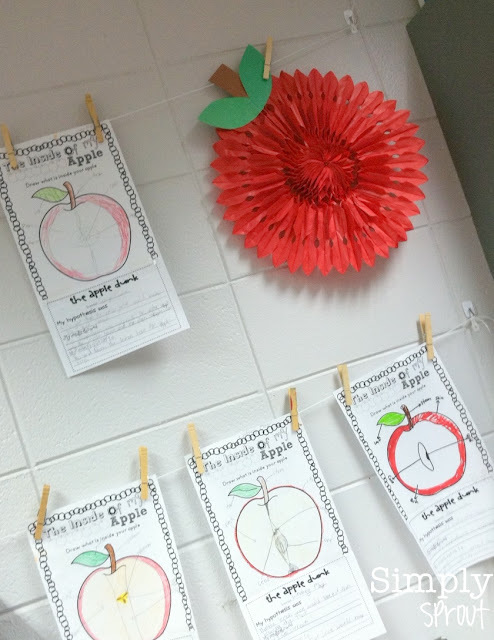 We talked about all the parts of the apple, including what makes up the core. After an hour, several observations, and reviewing our data, we were ready to draw some conclusions. 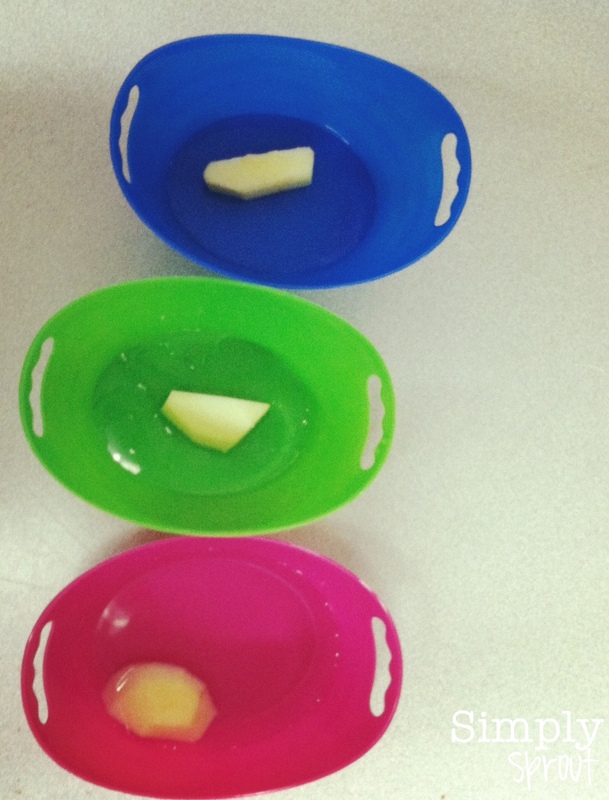 We concluded that the lemon juice helped preserve the apple slice the best. We had several trials set up around the room to insure that our findings were correct. My smarty pants students concluded that the acid from the lemon helped in the preservation process. Of course they were correct! They clearly saw that the slice left exposed to the air browned the quickest, the one in water was protected some what from oxygen, but that the lemon juice worked the best. We talked about the chemicals within the apple combining with oxygen to form a brown blanket of sorts over the apple to protect it. However, the vitamin C in the lemon juice binds with oxygen creating a barrier and limited the browning on the apple flesh. What a great science experiment and activity to usher in fall! We hope that you do some fall science soon too! Here is a freebie just for you! **I apologize for camera phone pics. This busy teacher was snapping away and teaching! Stop by our Simply Sprout Store to purchase the entire kit! Very cute!!! This would be an easy "experiment" for many or few.